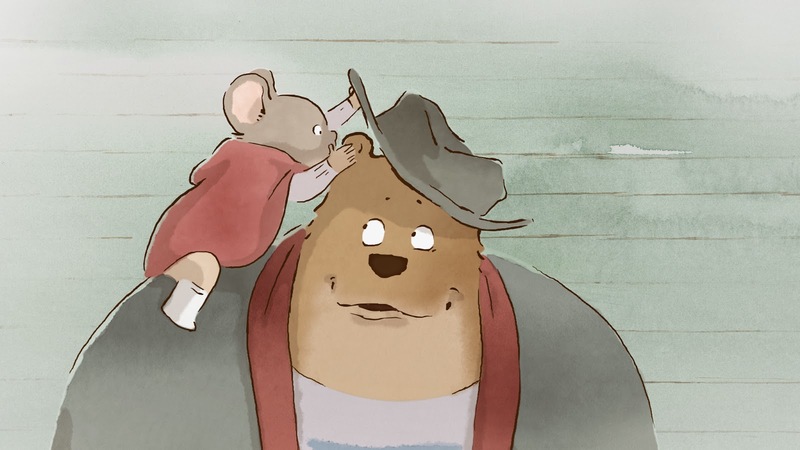 Specialty distributor GKIDS has quickly become the foremost purveyor of foreign animation in America. While Disney continues to distribute the works of Hayao Miyazaki (including his final masterpiece, The Wind Rises), GKIDS has been quietly bringing little-seen animated works from overseas that may not otherwise have found an American audience stateside, providing small scale, hand drawn alternatives to bigger, louder studio products. GKIDS first gained recognition when The Secret of Kells scored a surprised Oscar nomination for Best Animated Feature in 2009. The distributor scored two more nominations in 2011 for A Cat in Paris and Chico & Rita, and have several more chances to score nominations this year, where the major studios' animated projects have mostly proved disappointing. 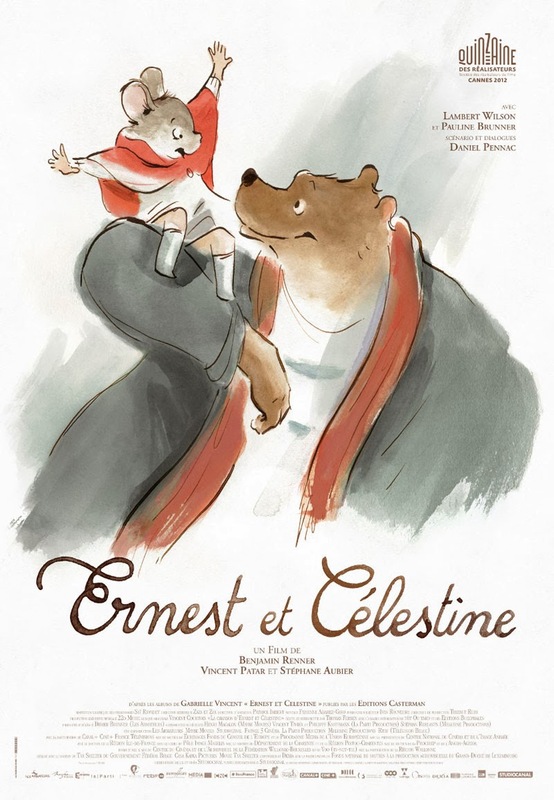 Their best shot at Oscar glory is Ernest & Celestine, a lovely little French film directed by Stéphane Aubier, Vincent Patar, and Benjamin Renner, based on the Belgian book series by Gabrielle Vincent. It's the story of a young mouse named Celestine who spends her days underground, training to be a dentist by sneaking into the world above populated by bears, and snatching young bears' teeth from under their pillows, leading to the bears' legend of the tooth fairy. The mice use the teeth to supplement their own, helping them build vast cities beneath the surface. Each night, Celestine lays in her bed doodling pictures while listening to stories about the "big bad bear," reinforcing the children's fear of the lupine citizens above. Celestine doesn't believe these horrific legends, and is determined to prove to her people that bears aren't as bad as they've been lead to believe. Up above, Ernest is a destitute bear just trying to get by. Cold and hungry, he works as a street musician for change while avoiding the stern policemen who frown on panhandling. One morning, he finds Celestine sleeping in a trashcan after a tooth reconnaissance mission went terribly wrong. 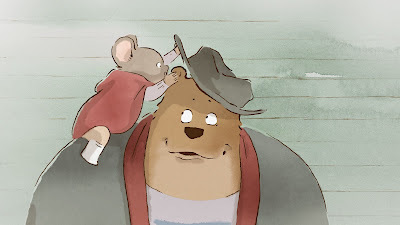 But instead of eating her (as was his first impulse), he befriends Celestine, and the two embark on a strange and remarkable journey, leading to a confrontation between the bears and the mice, but the unlikely friendship between Ernest and Celestine will force them all to examine their age old prejudices in ways they never expected. It's essentially a parable about racism, but it's handled with such grace that it never feels heavy handed or preachy. The story is admittedly idiosyncratic, but that's part of its charm. It's something new and unique, yet charmingly old fashioned. The more organic watercolor animation is such a breath of fresh air in a world populated with CG animation. 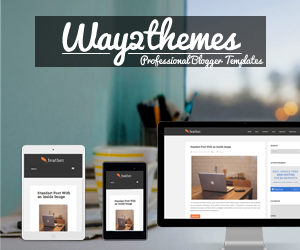 It feels like a storybook, and its hard not to get swept away in the gorgeous imagery. 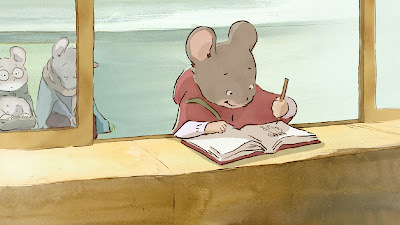 Ernest & Celestine is proof positive that you don't need flashy computer graphics to create a wholly immersive world. It is telling, I think, that the two best animated films I have seen this year, this and The Wind Rises, are both traditionally animated films. Computers are capable of creating some jaw dropping visual wonders like in Disney's Frozen, but there is just something special about hand drawn images. Not only are they more personal because of the work that goes into them, but they are also more expressive, more tangible, more relatable. As CG animation becomes more and more realistic, hand drawn animation feels more and more like works of art. What once was the norm has become a specialty, a rare breed, and films like this should be cherished. While foreign films like this are really more targeted to adults and art house audiences in the States because of their subtitles despite the GKIDS label, there is an agreeable innocence to Ernest & Celestine that should appeal to everyone. It takes an admittedly strange tale and turns into something wonderful, an utterly delightful tale of two misfits who find common ground through their mutual friendship. It's a simple message, beautifully conveyed without pretense, wrapped up in one of this year's animated treasures. 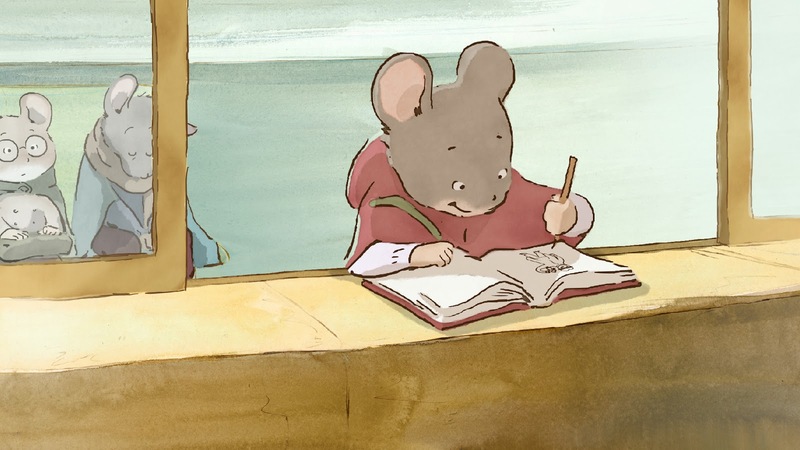 ERNEST & CELESTINE | Directed by Stéphane Aubier, Vincent Patar, and Benjamin Renner | Voices of Lambert Wilson, Pauline Brunner, Anne-Marie Loop, Patrice Melennec | Rated PG for some scary moments | In French w/English subtitles | Now playing in select cities.